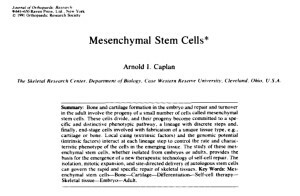 “Mesenchymal Stem Cells” was submitted for publication on September 17th 1990, 23 years ago 1. This publication outlined in part the basis for Dr. Caplan’s receiving the 1990 Elisabeth Winston Lanier Award given by the American Academy of Orthopaedic Surgeons as pat of the prestigious Kappa Delta Awards. In this historic article, you can appreciate that the entire MSC hypothesis and the Mesengenic Process diagram evolved from Dr. Caplan’s previous 20 years of study of bone and cartilage formation in the limbs of developing chick embryos, while he was also studying in-vivo limb development in mouse and human. While many others 2 , 3 , 4 studied various aspects of skeletal progenitors, no one ever put together the lineage diagram as Dr. Caplan did in the late 1980s (Figure 1) because no one had their monoclonal antibody approach or data 5 , 6. Indeed, Dr. Caplan and collaborators had already isolated human MSCs and had isolated 3 specific monoclonal cell surface markers, called SH2, SH3, SH4 (these eventually were similar to CD105 and CD73 now considered the signatures for hMSCs). Dr. Caplan and collaborators submitted 4 patents in 1990 which eventually served as the basis for starting Osiris, Inc. Eventually, Pittenger and other employees of Osiris repeated all of Dr. Caplan’s early work, cloned hMSCs and documented their multipotency. 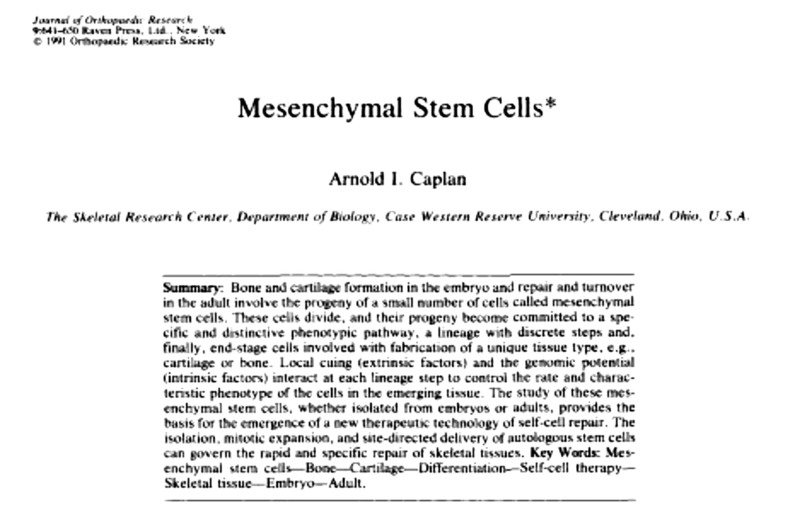 It was this paper, Dr. Caplan’s Kappa Delta Award and his published work on bone and cartilage which, together with his worldwide lectures, popularized MSCs. The fact that the procedures developed by Dr. Caplan and collaborators’ from the late 1980s still represent the gold standard of the MSC industry is proof of their widespread reproducibility and utility. I still remembered when I first read Dr. Caplan’s fascinating work which prompted me to invite him to give a plenary lecture at the 1st International Congress of the then neo-formed Cell Transplant Society, in Pittsburgh in 1992. The new science of pericytes/Medicinal Signaling Cells/MSCs evolved from the expansion of this base technology. These findings subsequently converged with the identification of MSCs from every tissue and the clear documentation of the identity of pericytes with MSCs by Peault and collaborators 7. While the potential new clinical uses of MSCs continue to expand in experimental and clinical practice 8 , 9 , 10, hundreds of clinical trials will help distinguish hype from hope and those that eventually will become established clinical applications as per modern “evidence based medicine” standards. However, it is also thank to these innovative pilot clinical trials, in addition to basic science contributions, that the field of regenerative medicine and its applications will continue to evolve, despite the obstacles to innovation and the development of cures that are currently limiting translational research efforts in several countries. It was therefore appropriate to select this historical paper by Dr. Arnold I. Caplan as the first pioneering paper of this “Back to The Future” feature section of CellR4. Caplan AI. 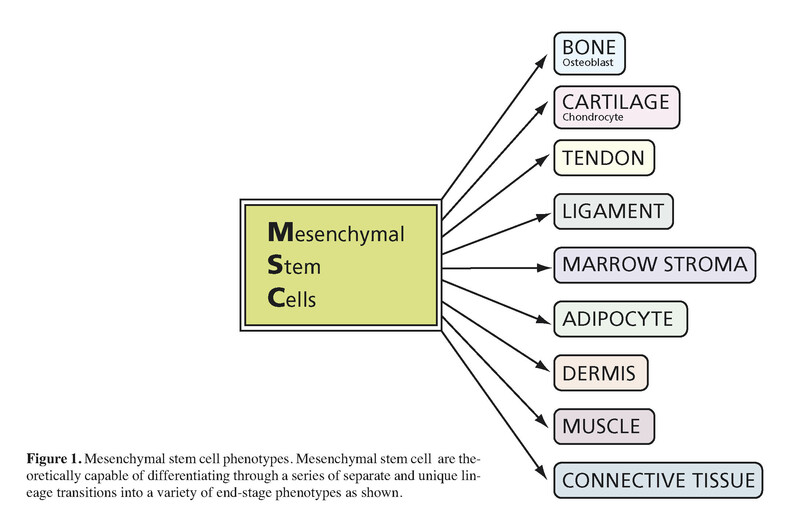 Mesenchymal Stem Cells. J Orthopaed Res 1991; 9(5): 641-650. 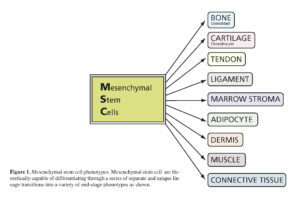 Owen M. Lineage of osteogenic cells and their relationship to the stromal system. In: WA Peck, Ed. Bone and Mineral Research, Vol. 3, New York, Elsevier, 1985; pp. 1-25. Owens EM, Solursh M. In vitro histogenic capacities of limb mesenchyme from various stage mouse embryos. Dev Biol 1981; 88: 297-311. Zipori D, Lee F. Introduction of interleukin-3 gene into stromal cells from the bone marrow alters hematopoietic differentiation but does not modify stem cell renewal. Blood 1988; 71: 586-596. Bruder SP, Caplan AI. First bone formation and the dissection of an osteogenic lineage in the embryonic chick tibia is revealed by monoclonal antibodies against osteoblasts. Bone 1989; 10: 359-375. Bruder SP, Caplan AI. Terminal differentiation of osteogenic cells in the embryonic chick tibia is revealed by a monoclonal antibody against osteocytes. Bone 1990; 11: 189-198. Crisan M, Yap S, Casteilla L, Chen CW, et al. A perivascular origin for mesenchymal stem cells in multiple human organs. Cell Stem Cell 2008; 3(3): 301-313. Losordo DW, Zeiher AM. Angels and Demons: Part II. Circ Res 2013; 113(1): 20-21.